About - Rintoul's Leisurescapes - Above Ground, Inground Pool and Landscape ideas for Owen Sound, Port Elgin and surrounding areas. Rintoul's has been selling, installing, and servicing Pools and Hot Tubs since 1970.The original location was opened in Wingham and is still operating. In 1988, a second location was opened in Owen Sound to better service this particular market. Our newest location opened in 2005 in the town of Port Elgin. Philip Rintoul, owner and operator, is committed to building and supplying the best quality products in the marketplace. After 48 years of experience in the business, we are very proud to have sold and installed thousands of quality Pools and Spas. Call or come in and see why a Rintoul's pool or Hot Tub can help you live your dream for years to come. 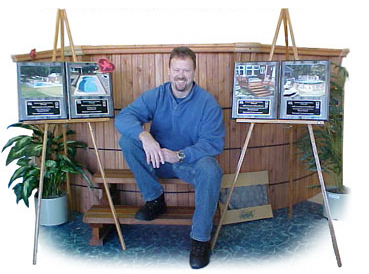 In 2003, Rintoul's Leisurescapes was recognized by the National Spa & Pool Institute of Canada and received four awards for excellence in a national competition for quality built Pools and Spas. Rintoul's is proud to have been nominated for the 2006 Owen Sound and District Chamber of Commerce Outstanding Business Achievement Award for Customer Service. Rintoul's is proud to have been awarded the Owen Sound Sun Times Reader's Choice Award for best Swimming Pools store. We would like to thank our customers and the Sun Times readership for this honour.